Welcome members, visitors and friends to our website! We try to update our website on a weekly basis to inform our members, visitors and friends. What donations and funding will help with! 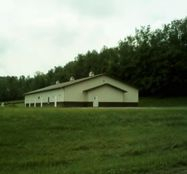 If you want to see our no-kill animal shelter finished and open to operate, we need help monetarily. Any donations in any amount will help us get more construction done. As we get bids for various stages of interior construction, we will update you in the progress page. Our no-kill shelter is in need of donations at the present time which will take many dollars to complete. It takes a lot of money to keep going and to finish our shelter and then run it. So, therefore, send in your donations in any amount, and it will go towards our shelter construction needs! We must have the geothermal heating and cooling finished, the ceiling grid and the tiles, the doors to each room with glass windows inside to observe animals, cement outside the shelter all the way around, cement for the walkway out front and the handicapped area and a ramp to enter the building, plumbing, toilets, sinks, EPA water well drilled, EPA sewer plant, lights, floor covering, Kennel walls, doors & windows finished, cement block kennels finished with chain link fencing over them, and doors to each kennel run, drop-down doors between kennels, chain link fencing around entire shelter, security videos, phones, intercom, and so much more! Tell others about us and tell them we will keep their donations local as best we can. Yes, we are applying for grants to help with expenses as we do construction, but your donations would help us even more to get closer to our goal of finishing our no-kill animal shelter and then operate it to save lives! Our construction progress for 2017- 2019 and more to do! January 2019: On January 7th, the ceiling grid installation will be started throughout the main rooms, except the laundry and mechanical rooms where it is not needed. January 18th, 2019: The ceiling grid was completed at a cost of $6,860.00. February 4th. 2019- Richardson Electric started installing the LED ceiling lights, EXIT signs above doors, and the sensors throughout the main rooms.. Then on February 9th, 2019, Richardson Electric started in installing the conduit to hold the electric lines to the LED ceiling lights in the kennel area. February 21st, - February March 1st, 2019- Richardson Electric continued installing the LED light in the kennel and are presently hooking up all the LED lights throughout the shelter. April 2019: All LED lights have been installed in main rooms & kennel area. Also installed are the sensor switches and emergency lights. June 12, 2018: The drywall for all the interior main rooms has arrived! Cost: $15,500.00. June 13, 2018: The drywall has been started in the main rooms. June 22, 2018: The drywall is hung in all the interior rooms. Now the contractor will tape & seal all the drywall this week! July 5, 2018: The drywall project has been completed in all the main rooms. Cost: $15,500.00 pd. July 25, 2018 - Yoder Geothermal Drilling started drilling for the 15 loops that will go underground for the Geothermal system. This part of the project has been paid. August 6, 2018 - The primer will be applied to all rooms and areas of the main areas to cover the drywall. Then one coat of paint will be applied over the primer. August 2018 - The primer and satin paint has been applied to all the interior main rooms at a cost of $3,500.37. Paid. August-September 2018 - Richardson Electric is putting in the electrical switches for lights, and the outlets and covers for all. They will also be working with Roberts Geothermal HV/AC to put in the panel to supply the electric for the Geothermal system. August - September 2018 - Roberts Geothermal is putting in more Geo. equipment in the mechanical room and doing more venting for the Geo. system and the HV/AC. September 2018 - Yoder Drilling & Geothermal are presently digging the trenches to lay the pipes in to connect the Geo. loops to the pipes, and then to the inside of the shelter in the mechanical room. See the additional pictures in the "Geothermal Installation" tab! September 2018- The pipes and loops are connected underground. Now we wait for the Geothermal system to be finished to start the HV/AC running. October 2018 - Richardson Electric has completed the electrical wiring and additional breaker boxes to hook up the Geothermal equipment. Cost: $3,056.00 paid. November 2018 - Almost ready to get the heat running in the main rooms! November 2018 - Heat is running in the main rooms! November 2018 - The suspended ceiling bids are in. Deciding on contractor to install. 2018 Update: Richardson Electric is still working on Phase II. We have selected a drywall contractor to drywall all the rooms in the main areas. There has been a delay in putting up the drywall and it has been scheduled now for June, 2018. We had to order two steel frames, and two galvanized steel doors, plus the sliding window that will go between the intake area and the office so that the drywall can be installed after these things are in place. Cost for steel doors & frames: $2,333.00, plus cost of glass window and labor for installing them. Roberts Plumbing, HV/AC has been delayed in finishing the rest of the plumbing and installing more venting for the Geothermal due to State and County delays in permits, etc. Updates when he resumes and can finish his work. We are also getting bids on the foyer work and the dropped ceiling throughout the main rooms. April 2018 Update: The Geothermal system venting and duct work is being installed throughout the shelter which has to be done next. (This is necessary to protect the drywall once it is installed and maintained in the winter at 50 degrees.) Once the drywall is installed, then the suspended ceiling and grid work can be done. Richardson Electric can continue with installing plate covers, lights, and more. Moving along, slowly but surely. JUNE 2017 - A.E.P. SET UP POLE, TRANSFORMER, BASIC SERVICE TO START- $1,515.05. PAID. JULY 2017- 6" TO 8" CEMENT POURED IN MAIN ROOM & KENNEL AREA RICHMOND CONCRETE -CARROLLTON - $46,755.50 PAID. JULY 2017 - A.E.P. ELECTRIC POWER POLE INSTALLED- COST UNKNOWN AT THIS TIME. BALANCE TO BE DETERMINED ONCE SERVICE IS INSTALLED AND CONNECTED- POSSIBLY $10,000. SEPTEMBER-OCTOBER 2017 INTERIOR PRIMING AND PAINTING OF WINDOWS INSIDE & NEW DRAINAGE PIPES FOR DOWNSPOUTS - DAVID FLANARY - CARROLLTON - COST: $880.00 PAID. SEPTEMBER- 2017 DUCT WORK INSTALLED IN MAIN ROOM - ROBERTS PLUMBING, HV/A/C & GEOTHERMAL -$5,000.00 DOWN. OCTOBER - 2017- DEEP TRENCH DUG FOR RUNNING ELECTRIC UNDERGROUND. 3- ELECTRICAL CONDUITS (PIPES) IN TRENCH. STATE INSPECTED. CLOSED TRENCH. OCTOBER - 2017- KENNEL CEILING MATERIALS DELIVERED BY MORTON BUILDINGS, INC. AND OCTOBER 19, 2017- MORTON'S BUILDINGS, INC. INSTALLED STEEL CEILING IN KENNEL AREA, PLUS INSULATION AND PLASTIC BARRIER - COST: $9,511.00 PAID. DECEMBER 4TH, 2017- CONDUIT & ELECTRIC LINES RUN IN MAIN AREA BY RICHARDSON ELECTRIC (to hook up 3 electrical panel boxes after stud walls of rooms are up). INSULATION BLOWN INTO MAIN AREA - D & D INSULATION - MINERVA -COST: $2,820.00. DONE DECEMBER 11TH, 2017. INTERIOR STUD WALLS FOR ROOMS - DAVID FLANARY - CARROLLTON ESTIMATE COST: $9500.00- STARTED, MONDAY, DECEMBER 11TH, 2017 AND FINISHED DECEMBER 28th, 2017. INSPECTED BY STATE 1-17-2018. FEBRUARY 1ST, 2018 - ROBERTS PLUMBING & HEATING - STARTED CONNECTING PLUMBING PIPES TO VENTS, INSTALLING HOT & COLD WATER LINES, AND MORE VENTING FOR THE GEOTHERMAL. Pd. $30,000.00 TOWARDS THE PROJECT. 2015-2018 -FINANCIAL SUPPORT-GRANTS, ESTATES, ETC. August 2017 McBane Insurance & Financial Services - Bergholz, Ohio $200.00 donation for their "Dress Down Days"
January 2016 - Received a check for $3900.00 from the Jerry & Janice Smith estate, from their daughter, Lori Perry. All proceeds will go towards the animal shelter construction. February 2016 - Received a check from Doug & Vicki Stephens for $500.00 in memory of Doug's Mother, Marcia Stephens. 2016 - April - $3,593.57 - Fraternal Order of Eagles #2185 donation. (note: FOE will give us a quarterly donation for the year of 2016 in a similar amount). 2016 - December - Received a refund check from Morton Buildings, Inc. of $43,260.00 due to the fact the cement contractor did not comply to their paperwork demands and cancelled the contract with the cement contractor. On December 7th, 2015, we received a check from the Rick & Carol Hannon Foundation for $25,000.00 towards continued construction of our no-kill animal shelter. We will use this most generous gift in the spring for further construction We thank Rick and Carol for their generosity and support! November 2015 UPDATE: On November 5th, we received a letter from Director Ralph Castellucci of the Carroll County Environmental Services stating "we will be allowed to put the dog waste in the sewer hook-up" when it comes down from Malvern to Carrollton in 2017. UPDATE 2017: We will now wait until we are notified if we have to put in our own sewer system plant and drill a water well. Please help us keep going to get our animal shelter finished! Donate today-thank you! October, 2015 UPDATE: The CCAPL Board of Directors chose Sheckler Excavating, In. of Malvern, Ohio to install the sewer system at a cost of approximately $56,920.00 when and if we need to put in our own sewer system. Updated 2017. From June 3rd, 2015, to June 16th, 2015- Morton Buildings, Inc. constructed the shell of our no-kill animal shelter. Cost: $129,500.00 paid in full. Finished the "shell" of our no-kill animal shelter building. Cost was $129,500.00 and is paid for. Plus, paid $22,500.00 for the mechanical plans to be done. The Carroll County Animal Protection League needs your help to finish our building, inside and out! This includes the plumbing, cement, interior walls, heating/cooling system, fencing, electrical, well-drilling, and so much more! We have worked so hard to reach this stage, and need your help to keep going to completion! HELP US TODAY! DONATE TODAY! Photo by Kim Lewis, Carroll County Convention and Visitors Bureau. Attendees at our ground-breaking ceremony, Sunday, May 31st. 2015 and their dogs. The rain held off for our ceremony! Thanks to everyone who attended and made this day so special for us! Special thanks to Don Gray who held the American Flag for the Pledge of Allegiance. Sylvia Sauer for her opening prayer. Patti Willoughby, CCAPL Treasurer for her financial update. Mark Wells for his dedication blessing prayer. Speech was given by President, Eileen Rohrer. UPDATE: We are on our way to construction! Hi, Awesome supporters and animal-loving friends! 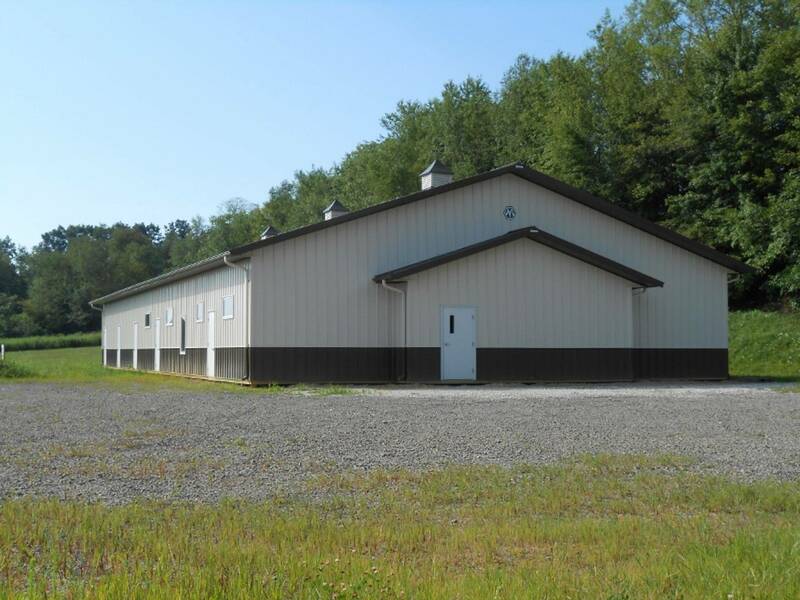 UPDATE-We received the word on May 13th, 2015 from Shawn Simmerman of Morton Buildings, Inc. and they will be delivering our new building on Wednesday, June 3rd, 2015 on our land! How exciting is this! Wow! Yippee! 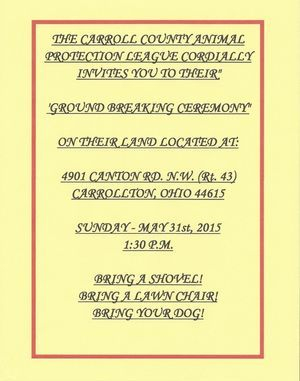 Therefore, our "Ground Breaking Ceremony" will be held on Sunday, May 31st, at 1:30 p.m. on our land, so bring your puppy dogs, family, friends, shovels and lawn chairs to celebrate this huge event for us! Rain or shine! We could not have reached this milestone without all your generosity of donations, volunteerism, support and of course your commitment to us to get this far in reaching our goal- the beginning construction of the no-kill animal shelter building! Hope to see you at the "Ground Breaking!" And please have "Fido-dog" on a leash for safety reasons! 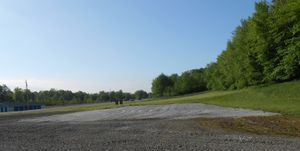 May 18, 2015 - Finished preparing the site pad! Sheckler Excavating, Inc. came out on Monday, May 18, 2015. They scrapped off the vegetation on the animal shelter site pad and put down limestone in preparation of the building arriving June 3rd, 2015! May 13th. 2015- Four test holes done on all four corners to assure the land can hold the building- passed! CCAPL Board of Directors presented Shawn Simmerman of Morton Buildings, Inc. a check for $129,500.00 at their meeting on April 22nd 2015! It will take at least 6-8 weeks for Morton's to put together our order of the building for delivery. Shawn told us the construction of the animal shelter building-shell will be done either mid-June or around the first part of July! We will know very soon of the delivery date and will post the update ASAP! We will coincide this delivery of our building with a "Ground Breaking Ceremony" (bring a shovel), right before the delivery, more than likely on a Sunday afternoon the day before delivery! How exciting!! Wow! So watch for "THE OFFICIAL DATE" to be in on this wonderful event we have worked so hard to attain and to get started! We are finally on our way and because of so many of you and your devotion, dedication, monetary and other donations of support and commitment and belief in us, we are getting started! Yippee! We will also be drilling the well and AEP will be installing the electric pole with the transformer, etc. for the new service for our building. Once those two things are done, we will concentrate on the next steps to keep going! UPDATE: April 17, 2015. We have received the approved permit to build the "shell" of the building for the no-kill animal shelter construction from the State of Ohio. We are currently sending them to prospective contractors in and around the area of Carroll County, Ohio, for bids for the work that will need done inside the no-kill animal shelter. We will keep you posted on our progress. We are starting construction in the June 3rd, 2015 to construct the shell of the building. We have raised the $129,500.00 to put up the shell. We will go from there. Please continue to support our efforts to build our no-kill animal shelter to save lives of domestic animals! Thank you. THE SIGN IS UP! July 3rd, 2014! December 2014 update: The mechanical plans are almost done. Once finished, they will be presented to the CCAPL's Board of Directors. Once approved, they will be sent to the State of Ohio for the permits. Once the permits are issued, we will begin construction in the spring of 2015! We will keep you informed of our progress as it happens! Thank you! The Morton Buildings, Inc. sign is on our property. It was installed on Thursday, July 3rd, at 1:30 p.m. by Shawn Simmerman (lower right), Morton's Project Manager and Mike Weckesser (lower left). CCAPL members present are Eileen Rohrer, Roberta Rothert, Kim Mills, Lynne Prince and her granddaughter and great-granddaughter, and Don Gray. As soon as all the mechanical plans are done, we want to start building as early as late fall 2014, or early spring 2015. We will keep you posted on our progress. Donate today to help us build our no-kill animal shelter! Thank you! 2014- GREAT NEWS! WE ARE ON OUR WAY TO STARTING CONSTRUCTION! September 2014- We are currently waiting for all the mechanical plans to be completed and approved by the State of Ohio, and for the building permits to be issued. We will start construction in the spring of 2015! Shawn Simmerman, the Morton Buildings, Inc. representative, was notified Thursday evening regarding the vote to move forward. Shawn advised the Board of Directors at the April 24th, director's meeting, it will take approximately 4-6 months before actual start-up construction could take place. That is okay, we have worked so hard in the last seven years and almost four months to get to this stage. Once Step 2 is completed, Shawn will handle Step 3, the actual start of construction of our no-kill animal shelter. We will send Morton Buildings, Inc. a check for $129,500.00 to pay the cost of the "shell" of the building. This will include the exterior walls, roof, windows, exterior doors, and also the insulation throughout. More updates as they happen-stay tuned! A special thanks to everyone who has helped us and contributed to us along the way of our journey since we started January 17, 2007 to build a no-kill animal shelter for Carroll County, Carrollton, Ohio! February, 2014 - The CCAPL received a $10,150.00 grant from the Douglas Houck Charitable Fund towards the no-kill animal shelter construction. 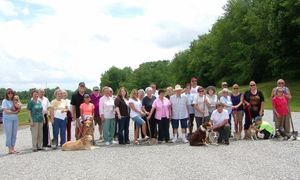 April 7th, 2014 - The Carroll County Animal Protection League has received the second monetary grant from the The John H. & Evelyn L. Ashton Preservation Association, Inc.of Carrollton, Ohio. Their commitment to us is $4,000.00 each year from 2013 to 2015. We thank the John H. & Evelyn L. Ashton Preservation Association, Inc. for their generosity and support to us. This monetary donation grant will be used in the no-kill animal shelter construction.